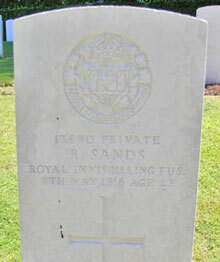 Robert Sands was the second son of William and Ellen / Eleanor Sands. Robert was born about 1893 in Tamlaght, Coagh, County Tyrone. He was one of ten children. The family lived in Coagh. His father was a labourer. Before joining the army, Robert was a member of Coagh Company of Ulster Volunteers, and was a member of Drumconvis LOL 794. 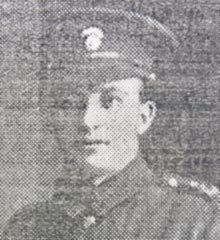 Private Robert Sands was killed in action on the night of 7th/8th May 1916, soon after a successful trench raid against the enemy.